The Line Master mastering speaker contains every KS Digital innovation in one monitor. The KS Digital Line Master begins with full Firtec DSP implementation, bringing absolute linear phase, ruler-flat frequency response, and 100% accurate dynamic range reproduction that perfectly matches the signal fed to its input. Firtec DSP corrects for your room using advanced FIR technology, but also for the speaker itself--something no other manufacturer has accomplished. DMC Dynamic Membrane Control is also onboard, a system which controls the dynamic movement of the woofer with zero latency. It compares the input signal to the physical dynamics of the woofer, controlling its movement so the response is matched exactly to what's fed into it. The result is that the speaker reacts exactly as it should, no more or no less, giving you a distortion-free, perfect representation of your music. NExT Nearfield Extension Technology is then added, turning the high frequency driver output into a cylindrical wave radiator. With a cylindrical wave, the acoustic energy reduces by 3dB when the distance is doubled; with a normal spherical wave, this reduction is 6dB. The result (only possible with NExT speakers) is that your listening area appears practically anywhere in front of the studio speakers. With all three technologies in one speaker, the Line Master becomes the most accurate mastering speaker ever created. Put it up against any mastering monitors on the market, and you can instantly hear the difference that absolute linear phase output, FIR technology for frequency and dynamic response correction, low frequency membrane control, and cylindrical wave emission can make in your studio mastering work. The KS Digital Line Master is a self-powered, tri-amplified, full-range mastering speaker. Driven by 350W / 200W / 100W amplifiers, the Line Master has an abundance of power behind its accurate presentation. It covers the entire 20Hz to 24kHz listening spectrum, and handles 125dB SPL of output. The Line Master is also a fully integrated monitor control--a KS Digital hardware or software remote can control the entire system, eliminating expensive outboard monitor controllers or digital faders. This system controls the volume of the actual Line Master amplifiers AFTER digital conversion, meaning you don't sacrifice bit depth or digital dynamic range like on all other manufacturers' systems. This control integration matched with the Firtec DSP, DMC, and NExT technologies contained within the Line Master gives you "the sonic truth"--the most accurate, uncolored, dynamic presentation of your music possible. 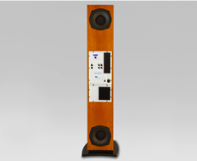 And with its advanced room-correcting FIR technology (hence the name, "FIRtec"), KS Digital accomplishes its perfect output differently than any other speaker manufacturer--all of whom use traditional equalization and filters to achieve a flat response, which of course leads to phase issues and compromised dynamic response. Utilizing Firtec is like taking the veil off of traditional mastering speakers and DSP studio monitoring sound design, as it presents the music phase-perfect with full dynamic response--no compromises are made to output the signal as perfectly as it arrives at the input. Precision in all aspects of studio mastering sound reproduction. All amplifiers and digital controls are mounted on the back of the Line Master, and everything is controllable via the remote (hardware or software). Since the Line Master has such a broad frequency response and dynamic range, you get a completely accurate presentation of your music in a "wall of sound" that rivals any competing mastering speaker systems made today. The Firtec DSP can also be tuned to your room so your studio speakers become even more accurate for your own particular environment--and as your environment changes, the DSP can be updated to match. As with all KS Digital studio monitoring, the Line Master is magnetically shielded, and it is hand-built in Germany for you and comes with a signed Certificate of Authenticity, as well as a full 2-year warranty. Test drive a pair today to hear what the technologies behind the Line Master can bring to your studio mastering... and run any source material through them that challenges other mastering speaker designs. You'll hear the clarity and responsiveness of the Line Master in every detail. … Very quickly it becomes “obvious” to the ears what phase linearity means. In the practical world, it means all frequencies reach the listening position at the same time, which results in a phenomenal listening experience. … The Line Master is a reliable tool for the connoisseur, presenting the sound perfectly in all dimensions: height, width, and depth. 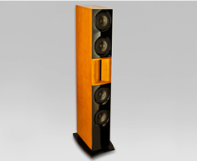 The bass reproduction is characterized by its clarity and dynamic range. The bass frequencies reach the listening position focused and razorblade sharp. Regardless or whether you play Japanese drums, busy lower-octave arpeggios in Beethoven’s later piano sonatas, or pounding sub-frequency synthesizer sounds, there is no trace of softness or diffused response. Sound engineers will be happy, as they can operate with an uncolored, open sound. … The Line Master is a studio reference monitor that satisfies the highest demands and requirements for neutral and accurate sound… it is a tool for professionals who do not want to compromise. … The Line Master shines in its very balanced tonality, which reflects the smallest differences in low frequencies with frightening clarity. … With the Line Master, German manufacturer KS Digital has delivered without any doubt a masterpiece of speaker development, which combines high-level design, excellent craftsmanship, and superior technology. … This speaker has every right to carry the name “reference monitor.” Frequency and dynamic response, and spatial depth and imaging complete its sound picture, which allows for an absolutely reliable, yet relaxed judgment on the material regardless of what type of music, with each detail exposed. … No question, the Line Master is hands-down a most exceptional product. Every mastering studio should not miss having a listening session. Dimensions H 170 x W 30 x D 45 cm, 67" x 12" x 17 2/3"